The Bardsey apple was named after the island of Bardsey, off the west coast of Wales, where this variety was first discovered in 1998. The unique location of Bardsey has made the island a place of pilgrimage and legend since ancient times. The discovery of an apparently new apple variety on the island therefore received widespread press coverage at the time. 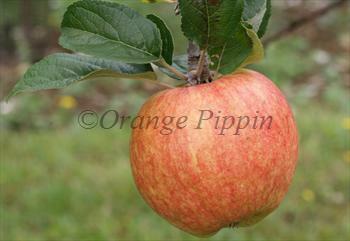 It turned out that the Bardsey apple was not only rather attractive, but also very disease-resistant. As a result it appears likely to be a good garden apple variety, particularly for the more challenging climates of the west of the UK. Bardsey apples are similar to the well-known James Grieve in many respects, although there is no known connection between them. 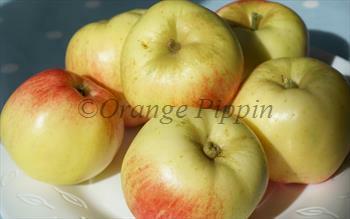 Like James Grieve they have a mild sweet flavour with some acidity, and a fairly crisp texture. They ripen in late August / early September. They are pleasant for eating fresh, and can also be juiced, and they will cook down to a sweet puree. Please fill in the details below and we will let you know when Bardsey apple trees are back in stock. Bardsey is in flowering group 2. Bardsey is self-sterile and needs to be pollinated by another tree of a different variety nearby. Bardsey is an island off the west coast of Wales. Although considered a bit drier than other parts of Wales it is still essentially a mild and wet climate, which favours many of the diseases to which apples are prone, particularly scab. To survive in this climate the Bardsey apple appears to have evolved very good disease resistance. It is therefore a useful variety to try in other damp mild climates such as the north-west of Scotland, parts of Cumbria, and Devon and Cornwall, as well as western Wales. The tree is known to be very hardy, but there is little information about the frost-resistance of its blossom, and freezing temperatures are relatively rare on the island. However anecdotal evidence from growers outside the UK suggests it is also tolerant of sub-zero winter temperatures, as well as summer heat and drought stress. Bardsey appears to have a partial tip-bearing tendency, but is nevertheless suitable for training in most forms. The original tree was found growing wild on the island of Bardsey in 1998. It was subsequently popularised by local nurseryman Ian Sturrock, and identified as a unique new variety by experts at the UK National Fruit Collection. It is sometimes also known as Merlin's apple, since the famous wizard is said to be buried on the island, although many other sites also make this claim. More information about the discovery of this variety and its cultivation can be found on the Bardsey website.